Unbroken : a short film review. 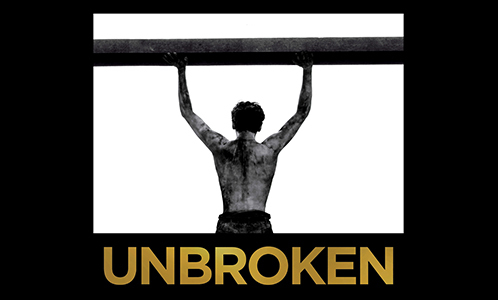 Unbroken is the second film directed by Angelina Jolie, based on the life of the Olympic athlete and World War II veteran Louis “Louie” Zamperini (whose life is described in Laura Hillenbrand’s book Unbroken : A World War II Story of Survival, Resilience and Redemption). Once a troublesome kid, Louis Zamperini became a very promising runner thanks to his big brother dedication. Joining the United States Army Air Forces as a bombardier during World War II, he had to survive in a raft for 47 days along with two other members of his division after their plane crashed in the middle of the ocean, only to be found by the Japanese Navy and sent to a camp dedicated to prisoners of war. There, he had to endure all the torments and cruel trials ordered by the war criminal Mutsuhiro “The Bird” Watanabe who tried to break him as much as he could. With this film, Angelina Jolie wants to pay tribute to Louis Zamperini who passed away on July 2, 2014 at the age of 97. If I was kind of afraid it wouldn’t match my expectations, it was a good exercise and a very inspirational story. Let’s say it immediately, the film has been criticized and considered by some as yet another movie made to glorify the all mighty America, but it shouldn’t be watched with this mindset. You may regret the fact that Japanese soldiers were the only ones presented as cruel and merciless military forces. As long as you keep in mind that there are no nice guys and bad guys in times of war, you can concentrate on what’s important and the goal of this film : to portray the strength of mind of Louis Zamperini. And this detail is what makes this movie a little bit more than yet another story of epic American soldiers fighting against the Big Bad Japanese. You’re not watching an American hero trying to endure the treatment of Japanese executioners, you’re watching a formidably tenacious man keeping faith and hope even when exposed to the worst trials that humans can inflict on each other. If you’re not interested in this kind of inspirational film, or if you’re fed up of those war environment movies, you can still do it your way : it’s a good and well-paced story, but not a masterpiece you’re forced to watch. In contrast, if a more insightful vision of the will power catches your attention, you should enjoy this production. It deals with the faith of a man, of how your life and that of those around you can forge your mind, of how far one can go and endure just for the sake of not giving up. Not a masterpiece, but still an inspirational movie about a man whose will, story and courage command respect.